There's still a lot of finger-pointing going on as to who brought it home, but we've been pretty sick around here. Some are totally fine, but the 1-year-old has croup (again!) and my 11-year-old was out of school for 4 out of 5 days this week and completely lost her voice. She made a valiant effort to carry on like normal even without functioning vocal chords, though. When her siblings started up a card game that involves playing a card or saying 'pass' each round, she drew up a handmade sign reading "PASS" taped to a paint stirring stick so she could join in. That was a funny-looking game. My 13-year-old gave a talk in church on Sunday and not only did she look exceptionally confident for standing up in front of 200 people, she also had some excellent scriptural insights that hadn't occurred to me before. She told the story of Jesus and the woman taken in adultery found in John 8: 3-11. I'd always read it as a cautionary tale against judging others, focusing on the Pharisees and how they all disappeared with their tails between their legs when Jesus told them "He that is without sin among you, let him first cast a stone at her." We shouldn't throw shade because nobody's perfect, right? But my daughter pointed out something I'd never really thought about before: there actually was someone perfect there. Jesus had never sinned, and by his own statement if anyone was justified in punishing her, he was. Instead he told her to "go, and sin no more." That story still teaches me not to judge others. But even more than that, I now think of it as a story that defines Christ's mercy better than any dictionary could. Phillip loves running with the new Garmin watch he got for Christmas. It can tell you how far you've gone, your average speed, and even if you need to speed up or slow down to meet your goal. He wears it around all day, actually, and when he's been sedentary for too long it buzzes to tell him he needs to move. I personally think that would be annoying, but I did find it funny the other night when it buzzed at him just before dessert. It's like his fitness watch was telling him to get up and go get cookies. Co-op preschool was at my house this week. We explored the letter T and talked about trains; we also made this cute train out of our snack. As I was giving instructions on how to do it, one of the 4-year-olds interrupted me with an important news bulletin: "Um, your nose looks kind of pointy." I couldn't blame her because (1) she's 4 and 4-year-olds like to go around telling overweight strangers at the grocery store they look like they have babies in their tummies, (2) she was looking at me in profile, and (3) yes, I do. 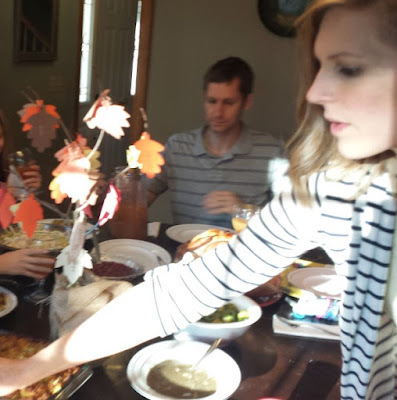 A semi-blurry photo for reference from Thanksgiving. However, I kind of like my nose (even if it does photobomb the corners of many a picture.) Plus, according to this weird article I found online, it means I'm going to have a great time in my 40s. Whatever that means. When we read the scriptures as a family before bed my 3-year-old likes to "read a verse" by having us say a few words at a time and repeating them after us. I was helping him with 1 Nephi 17: 50 which basically says when God commands you to do something, He'll help you accomplish that thing and "it will be done." My 3-year-old confidently finished the verse with what he thought he'd heard me say, which was "and it wouldn't be dumb." So I got this apple at the grocery store. 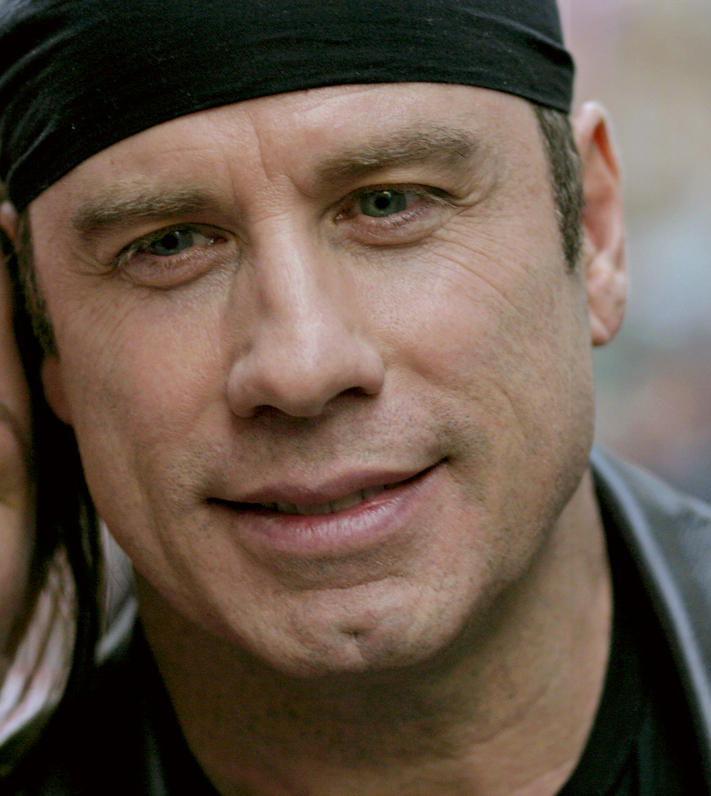 It was like opening up a bag of produce and finding John Travolta inside. I almost asked it for an autograph. I haven't seen Look Who's Talking since I was a kid but I remember thinking it was totally funny. My preschooler asked me to read a book in the living room but warned, "There's water on the couch." I saw water droplets on the sofa, but since that's certainly not the weirdest or the biggest mess I've seen in the living room, I didn't think anything of it. Until we were sitting there reading and I started to feel more mist falling on me. I looked up to see the 1-year-old standing on the balcony overlooking our two-story living room, methodically spraying water from the bathroom spray bottle over the railing. I have to say it looked pretty fun, and unlike when I forbid him to eat things from the trash, I completely understood his frustration when I took it away. I love your daughter's insight on the Bible story. I don't think I'd ever thought about it that way either. Definitely a strong lesson on mercy! I'm laughing so hard about the 4 year-old random comment. Lol!! Your 11 year old: future Speech Language Pathologist!!! Your 3 year old: It is what it is! Your 1 year old: Let it rain, girl! 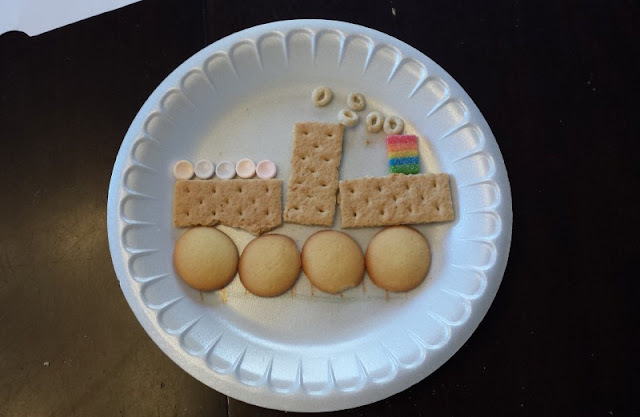 That snack train is super cute! There are way too many types of noses listed. I'm thoroughly confused as to how the next decade of my life is going to turn out. Angel got a GPS/running watch for Christmas, too, and I can't in a million years imagine wanting such a thing, but his new watch has been pretty amusing for me. The info connects to my smartphone since he doesn't have a phone that can work with the watch so I like making up stuff that the app is reporting that isn't even true just to mess with him. I also like judging how slow he went. "Seriously, only 9.73 kilometers in 1 hour and 6 minutes? That's shameful." And then he'll get all defensive: "But you have to look at the altitude change because I was running up the hill!" and I'm all cracking up because walking to the car is as far as I go.